Get In the Hot Spot is for travel loving women aged 40+ who want to be more adventurous, have more fun and feel fabulous. I’m here to help you stay active and live your dream at any age. Being adventurous doesn’t mean you have go skydiving! Adventure can just mean getting out of your comfort zone or changing your routine. Either way you’ll shake things up and feel more energised. 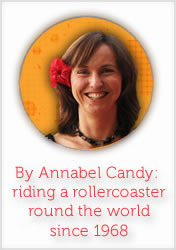 I’m Annabel Candy: copywriter, travel blogger, self-employed mum and delightful misfit. Most people love travel but I’ve designed my life around it; so far I’ve lived in eight countries and traveled to over 40. I started Get In the Hot Spot when I moved to Australia in 2010 to share my passion for travel and now have over 126,000 happy readers a year. My writing’s been featured in print in Australia and overseas and on some of the biggest blogs in the world including Gadling, Zen Habits and the Huffington Post. Life’s been good to me and I practice daily gratitude but there have been tough times too including battles with depression and a recent midlife crisis I tried to overcome by doing a different exercise every week for a whole year. Phew! You can read more about it in the 52 Exercises Quest. I cover both the good and the bad here because life isn’t one long holiday (although I wish it was!) so we have to deal with everything it throws at us. But the focus is always on travel, adventure and having fun because that’s what I want more of in life. Would You Like to Get In the Hot Spot? Get In the Hot Spot is a seriously fun travel and lifestyle blog where you can escape with travel stories and personal writing and get inspiration and tips to stay healthy so you’re ever-ready for adventure plan your next escape. A hot spot is a lively, exciting place. Putting yourself in the hot spot means challenging yourself. I want everyone to enjoy life in their own personal hot spot. Together we’re a winning team and I’m your personal cheer leader helping you get fitter than ever before and bring your travel and adventure dreams to life. Above all I promise to write blog posts that are uplifting and inspirational, that fit your travel or adventure goals and are easy for you to copy if you’d like to follow in my footsteps. Subscribe now for free weekly email updates so you don’t miss the hot stuff. My twenties were dedicated to travel, my thirties to parenting and, during my forties, I’m focusing on travel writing and helping other people live their travel dreams. Here are a few facts about me. I work from home on the stunning Sunshine Coast in Queensland, Australia. I’m not a true Aussie (I have British and New Zealand passports) but I enjoy living in Noosa, a famous Australian holiday resort that’s a popular holiday spot for the rich and famous. Sir Richard Branson owns an island here but we don’t hang out together much! I work for myself. My husband Rich and I set up our business in 1998 when I was pregnant with our first child. We run a web and blog design company called Mucho because Rich wanted to be the Mucho Man. We design websites for small business owners and specialize in digital travel marketing. We’d love to design your blog or website and you can also hire me as a copywriter, freelance writer or for hot digital marketing advice. If so email [email protected] now to get the conversation started. 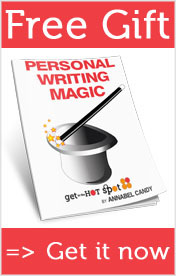 I’m a professional writer: I love all types of writing especially freelance travel writing and web copywriting. I love learning and have two degrees: a BA in French and English and an MA in Design for Interactive Media which I scored in 1996 making me an accidental digital marketing pioneer. I wrote Successful Blogging in 12 Simple Steps to help other small business owners tap into the power of blog marketing. I’m a great escape artist: I was born in the UK and have lived in the USA, France, Zimbabwe, Laos, New Zealand, Costa Rica and Australia. We lived in an over-the-water house in Bocas del Toro Island in Panama for a month too which was sensational but I don’t count that. I’ve traveled in Europe, the Middle East, South East Asia, North America, Africa, India, Central America, Australasia and the Pacific Islands. I really want to visit South America too. I’m married with kids: We have two boys and a girl. Our lads are at high school now and living with teenagers is another adventure altogether. I like a challenge: I’ve tried white water rafting and bungee jumping. I learnt to surf when I turned 40 and I skydived aged 45. In a word. Eeeek. I’m living my dream: My childhood dream was to be a writer, live by the sea and have children. I now live in a tropical climate near stunning beaches and divide my time between writing, family and enjoying nature. Don’t hate me, you can do it too. I’m obsessed with positive ageing: Life’s been fun but I believe the best is yet to come and hope I never settle down permanently. I still have many outstanding travel dreams on my travel bucket list including more travel around Australia, to South America, Central America and Asia, and a deep yearning to return to Africa and Europe. I know that will happen in the fullness of time. I’m a crazy cat lady. I was a fat baby and a skinny kid who grew up in the countryside and who’s best friend was a chicken called Penelope. I love languages and will murder any language when I’m travelling because it’s so fun speaking in foreign tongues. When I go on press trips under dietary requirements I always write ‘must eat chocolate at least twice day’. I’m serious. I love it. Especially Terry’s Chocolate Oranges, Mint Aeros, chocolate gingers, posh truffles and Moser Roth dark mint chocolate (from Aldi) which, despite my best intentions about eating Paleo and sugar-free, I gobble several bars of every single day. I’m incredibly nosy and convinced you’re way more interesting than me. I’d (still!) like to write a book one day. I’m excited about helping you be more adventurous, have more fun and feel fabulous. Subscribe now for free weekly email updates and I’ll help make your travel dreams come true.